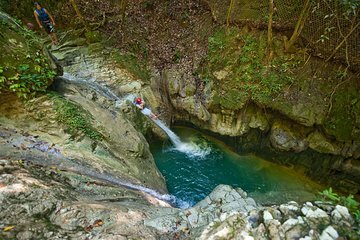 Descubre las aisladas Cascadas de Damajagua, escondidas en las colinas del Corredor Norte de la República Dominicana, en este viaje de un día desde Puerto Plata. Explore las veintisiete prístinas cataratas, en cascada sobre la piedra caliza, con su guía local. Obtenga una breve charla de seguridad, luego salte, nade y deslícese por toboganes naturales. Incluye almuerzo, bebidas y transporte de ida y vuelta desde los hoteles de Puerto Plata. So much fun, everything was planned well. A little too much attention on drinking and the food was mediocre but the place is amazing. Adventure, excitement, and fun. I had never done anything like this before. Jumping from over 30 feet into a narrow river, sliding off from natural rock slides, amazing. The views of the rock formations were like nothing I had ever seen before. The guides went out of their way to make sure everyone felt safe and offered their assistance to anyone who couldn't jump yes, my wife was one of those people shh..... This is an adventure for all ages... if you don't mind some hiking and a spike in adrenaline. The lunch provided was excellent. And the Dominican rum, the rum punch, nothing more to say. This was so much fun BUT it is for the 12 waterfalls, not all 27. I wanted all 27 and if you read the first few paragraphs it keeps mentioning 27 and only far down does it say that the adventure starts at the 12th fall. I think that is misleading. They need to put 12 in the title. We were very disappointed when we stopped at 12 and we were expecting to keep hiking up. That being aside, it was the most fun part of our vacation. The guides were incredible and the lunch was very good. Also, all the drinks you could want. Definitely recommend but know this is for 12 falls only. If it's a cloudy day, all 27 would get cold, because we got cold after 12 since it was overcast. The Damajagua excursion is definitely a once in a lifetime experience. Well worth a day of your vacation if you are in the Puerto Plata area. Make sure you call to confirm your reservation the day before your trip. You are picked up from your hotel lobby at an agreed upon time in an open air truck with bench seating. From there you drive to the waterfalls site and pick up your helmets and life jackets. As a women, I would recommend wearing your bathing suit with work out shorts and a tank top over it and water shoes. The life jacket you will be wearing will be damp, if not wet when you receive it. The tank helps with any chafing and the shorts will be practical for the hike. Leave behind jewelry and sunglasses. Your personal belongings will be locked in the cab of the truck while you are out on your excursion. The hike is about 45 minutes and mostly uphill to the 12 waterfalls. There are two big jumps and a couple of chutes that you will go down. You always have the option to climb down instead of jumping, however I would not recommend this trip to anyone not used to strenuous activity, people with major fears of water/heights, or children under the age of 13. The whole trip is very beautiful and scenic and the guides are AMAZING. TIP THEM! Afterwards you have a buffet lunch with booze, take a short trip though the city and to a local stone carver and then back to the hotel. My only complaints were that we were picked up a half hour late from our hotel and while the city/stone carvers trip was educational, by that time we were wet, cold, and tired and just wanted to get back to the hotel. Make sure you purchase the zip drive of photos for 45. It is well worth it. They send you photos and video of the whole trip. This tour was the highlight of my trip to DR, The sights and experience was AMAZING. I felt that the view the breath taking. I felt blessed to have this experience. DR tourism don't promote this experience has much as they should. Its a complete water experience so pictures are limited - if you have a chance to take this tour grab it. I don't swim and the tour guides caught me after each dive. Its been six months and I still remember it as one of my best days of 2016. My partner was unfamiliar with what the tour involved and he was equally exuberant about the experience. This tour was not as difficult as originally expected. The hike to the top was not so strenuous and the falls themselves were not too scary to jump. However, this is quite a different activity then what one would normally expect, and made for a very entertaining morning. The guides were very capable and made sure everyone stayed safe. The only thing I would caution, is that the ruff, rocky terrain does make it easy to sprain an ankle, if not careful. I would easily recommend this tour. Great tour but physically demanding. Not for those who are not in good physical condition. Long hike mostly incline, many stairs involved at the onset of the excursion. But a great reward awaits those who get through it--beautiful waterfalls and coves carved out by nature in the Dominican rain forest. Good hiking/water shoes a must! Get some with thick rubber soles. The trails are very rocky. One of the best tours we've done. Do wish the pick up from hotel was quicker though. So beautiful. Was not informed of the hour long hike up stairs before the waterfalls though. And after the excursion the bus driver went 30 min out of the way for us to stop at little shops that did not have anything good to buy. We were tired and just wanted to get home. It was supposed to be a half day excursion that turned into a full day one because of his stop.